A complete glass polishing kit for the detailer and the novice. Automotive glass correction is easier than you think. 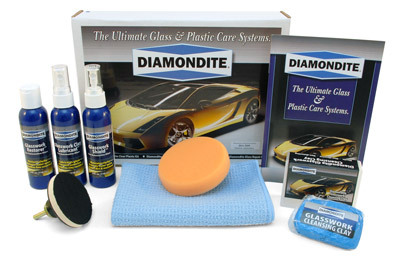 The Diamondite Glasswork Kit is designed to make the process of glass restoration not only possible for the average car owner, but practical. The Diamondite Glasswork Kit consists of four products that work in sequence to clean, polish, and protect automotive glass from a broad range of environmental contaminants. Each product works on the principles of paint detailing but with special glass-specific formulas. Diamondite glass products maximize the clarity and smoothness of glass while minimizing the risk of scratches. 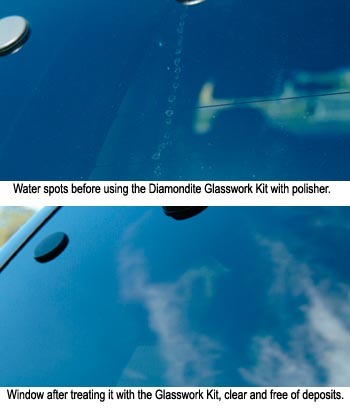 The Diamondite Glasswork Kit removes water spots, mineral deposits, tree sap mist, bugs, and oily films to recreate the look of new glass – all without distortion. No waves or blurry patches. This is the safest glass restoration kit you can buy. Using just your electric drill, you can correct a wide range of common glass imperfections to restore like-new clarity and smoothness. How do you know the glass needs to be clayed? Because it is clear, you can often see that the glass is bumpy or dirty. But even if it’s not plain to the naked eye, industrial pollution can be reducing the clarity of the glass and you don’t even know it. Perform this simple test to feel what your eyes can’t see: Put a plastic sandwich bag over your hand and lightly rub your fingertips over the glass. If the surface feels gritty, it will definitely benefit from DIamondite Glasswork Cleansing Clay. Diamondite Glasswork Clay is an elastic clay resin that cleans out the microscopic pores of glass to leave it incredibly slick and thoroughly clean. Glasswork clay cleans by gliding over the glass on a bed of lubricant and grabbing contaminants that are bonded to the glass. Remove bugs, overspray, tar, oil, tree sap mist, rail dust, and environmental pollutants. Diamondite Glaswork Clay even removes mineral deposits that haven’t yet etched the glass. Clayed glass will be incredibly smooth, clear, and clean. Clay is the safest way to clean when used with a proper lubricant. Diamondite Glasswork Clay Lubricant is a wetter-than-water lubricant spray that allows Glasswork Clay to glide along the glass, collecting debris, without scratching the glass. Overspray of this water-based lubricant will not harm other automotive surfaces. You may notice that water spots are still present on the glass. This is because water spots are caused by mineral deposits, which actually etch the glass. Even if the clay removes mineral deposits, it cannot undo the etching. Diamondite Glasswork Restorer can. This cleansing polish removes water spots, very fine scratches and etchings, and improves the clarity of automotive glass. Like a fine jeweler’s rouge immersed in a lubricating lotion, Glasswork Restorer gently polishes out fine imperfections in the glass to restore its factory-new clarity. This light polish will not scratch or distort glass. Protect your glass now and in the future with Diamondite Glasswork Shield. This polymer glass sealant is designed specifically to fill the microscopic ridges and valleys of glass. This perfectly clear coating repels dirt and moisture to maintain optimal visibility. Oily deposits would normally cause the windshield to become a hazy mess in the rain, but Glasswork Shield repels both oil and water to keep the windshield clear when it matters most. The slick coating also stops the chattering of windshield wiper blades and resists the bonding of bugs and bird droppings to the glass to make future cleaning easier. Glasswork Shield is a water-based polymer sealant that dries clear and streak-free when applied to clean glass. Clean the glass with Diamondite Perfect Vision Glass Cleaner and a soft microfiber towel. Pre-cleaning will prevent the Glasswork Cleansing Clay from becoming overly soiled. Mist the glass generously with Diamondite Glasswork Clay Lubricant. If doing a windshield, work in quarter sections. You may wish to cut the clay bar in half and reserve the other half in case you drop the clay you’re working with. Spread the clay flat over your fingers to give yourself an adequate work surface. Glide the clay back and forth over the wet glass. You will feel the clay grab. This indicates that it has encountered contamination on the glass. Continue to rub the clay bar back and forth until it glides freely. Use a microfiber towel to wipe the glass dry. If any clay residue remains on the glass, mist it with Diamondite Glasswork Clay Lubricant and wipe the glass clean. Continue claying until you’ve cleaned all the glass. Screw the drill adapter into the included backing plate and tighten with a wrench. Insert the adapter into your electric drill and tighten the chuck. Press the included 4 inch orange foam pad onto the backing plate. Dispense an X of Diamondite Glasswork Restorer across the pad. If you are using a drill or rotary polisher, set the maximum speed at 1800 RPM. Apply the polish on about a quarter of the windshield at a time. Work in an overlapping motion until cleaner starts to dry. There is no need to apply pressure to the machine. Use the included soft microfiber towel to remove residue. If water spots are not completely removed, repeat this process. Mist the glass with Diamondite Glasswork Shield and use the folded microfiber towel to spread the sealant over the glass. Flip the towel to a dry side and buff the glass to a bright shine. Allow Glasswork Shield to cure for an hour and then apply another coat if desired. The Diamondite Glasswork Kit for Machine Application treats the glass on 3-4 vehicles. For regular cleaning, use Diamondite Perfect Vision Glass Cleaner in the aerosol or pump spray. Add on a Dual Action Adapter for just $4.99. This adapter allows you to use the backing plate in this kit with your dual action polisher. Note:Tighten the adapter into the backing plate using a ¾ inch wrench.